Have you ever wondered what it would be like to run barefoot without worrying about hurting yourself on some unseen hazard? The Merrell Barefoot Pace Glove Running Shoe (Black-J35706) provides women a minimalist running shoe that effectively simulates the experience of barefoot running, without the dangers of going fully barefoot. The Merrell Barefoot Pace Glove simulates the experience of running barefoot. The barefoot running movement has grown in popularity in recent years, claiming better form, balance, and relief from chronic injuries. Barefoot runners run naturally, landing on the forefront of their feet rather than striking their heels on the ground with every stride. Merrell’s Barefoot Pace Glove is intended to give runners the additional benefit of protection from the elements… particularly the hazards your foot might encounter when meeting the earth in a full off-road sprint. While the jury is still out on whether barefoot running is all it’s cracked up to be, there is no question that the Merrell Barefoot Pace Glove is. The sole is extremely durable and will keep your feet safe and happy for a long time. They are also lightweight and flexible, allowing for a full, natural range of motion. The zero ball to heel drop means that your heel won’t be artificially raised; they will instead promote the biomechanics of natural running. And there is one more, extremely important feature that makes these shoes not just good for barefoot running, but great for everyday use: they are attractive, and they look like regular shoes! barefoot running must be worked up to gradually to avoid injury! 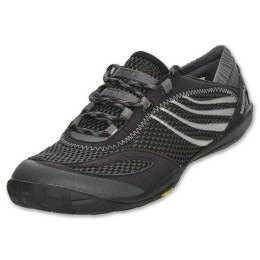 The Merrell Barefoot Pace Glove running shoes come in a plethora of color varieties. But if Merrell’s Pace Glove isn’t for you, you could try the Merrell Barefoot Trail Glove for men, or one of these other brands: the VIVOBAREFOOT Ultra Running Shoe, the New Balance WT10 Women’s Minimus Trail Running Shoe, or the Women’s Vibran FiveFingers varieties. With an average consumer rating of close to 5 stars on most shops’ websites, the Merrell Barefoot Pace Glove running shoes are making a distinctly positive impact―while lessening the impact on your feet. For $100, you’ll be paying about the same amount as comparable brands of barefoot running shoes, but their durability ensures that you will get more than your money’s worth. And you will look good going it.